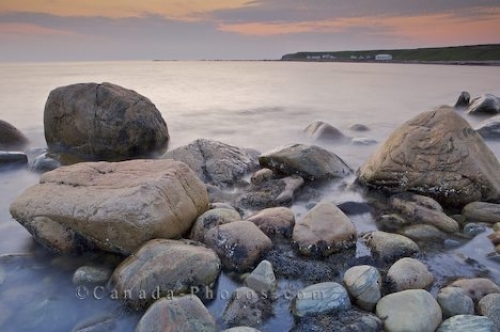 The sky takes on a soft pink and yellow appearance at sunset over the coastal shores at Green Point in Gros Morne National Park in Newfoundland, Canada. The sunset lighting reflects off the different shapes and sizes of rocks at Green Point as the water creates small pools amongst them. Green Point is a beautiful place to watch a sunset highlight the sky and travelers will find a camp site within close proximity to relax and spend a few tranquil days. When the tide is out, the rocks become visible making it a unique place to explore for the different sea creatures residing under and around the rocks. Gros Morne National Park has small towns scattered along the coastal shores of Newfoundland with Rocky Harbour being the closest to Green Point which is about 12 kilometers south. Picture of the water encircling the rocks on the coastline of Green Point in Gros Morne National Park, Newfoundland at sunset.